Sprouted brown rice, sometimes called germinated brown rice, looks similar to regular brown rice. Once cooked, however, the sprouted rice yields a slightly sweeter flavor and a less chewy texture. Swapping your usual brown rice for the sprouted version can also increase the amount of nutrients you get from the grain. Sprouted brown rice can be used in many of the same recipes in which you already use regular brown rice. A one-quarter-cup serving of sprouted brown rice contains 170 calories and 1.5 grams of fat, which is 2 percent of your daily value for fat. Sprouted brown rice doesn't contain any saturated fat, which makes it a heart-healthy choice. A one-quarter-cup serving of sprouted brown rice has 4 grams of protein, which is 9 percent of the 46 grams women need each day and 7 percent of the 56 grams men require on daily basis. Sprouted brown rice delivers 2 grams of fiber per one-quarter-cup serving. That's 8 percent of the 25 grams of fiber women need each day and 5 percent of the 38 grams men require daily. Fiber promotes normal digestion and can reduce the risk of constipation and medical problems such as heart disease. A serving of sprouted brown rice also supplies a small amount of iron. Sprouted brown rice is soaked in water for several hours, and this helps make the nutrients the grain contains more bio-available, according to the Food and Agriculture Organization of the United Nations. For example, sprouted brown rice has four times more fiber and vitamin E than regular rice and three times more vitamin B-1, vitamin B-6 and magnesium. Sprouted brown rice might also boost the immune system, lower blood pressure, reduce anxiety and prevent the formation of cancerous cells, according to a 2011 article published in the "Journal of Food Science and Technology." 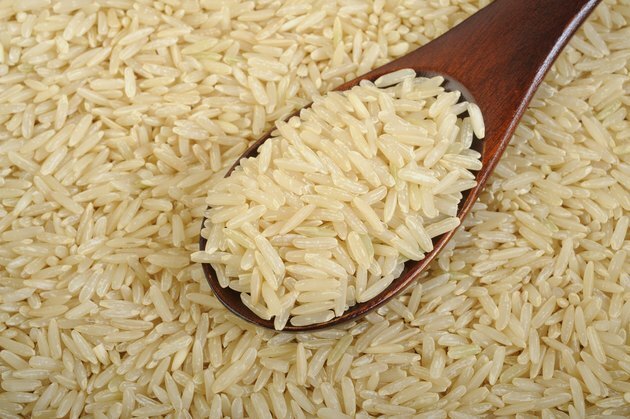 The rice can help regulate blood glucose levels, as well, notes a 2008 article published in the "Journal of Nutritional Science and Vitaminology." Look for sprouted brown rice at health food stores or in the health foods section of your supermarket. Cook sprouted brown rice just as you would regular brown rice, according to the "New York Times." Combine the cooked sprouted brown rice with sautéed vegetables and steamed meat, such as chicken, for a complete and nutritious meal. Add cooked sprouted brown rice to chicken or vegetable soup to make it more filling and to increase the nutrient content. What Are the Benefits of Eating Cornmeal?